Rolf Suey - Better Late Than Never: What Are Your Big Ideas for Singapore? How not to enjoy life, when you can start your Sunday having Dim Sum, followed by shopping and a cup of coffee. I did exactly that with my family today. Thereafter I was somehow lured by the “scent of books”, walking into Kinokuniya Bookstore. 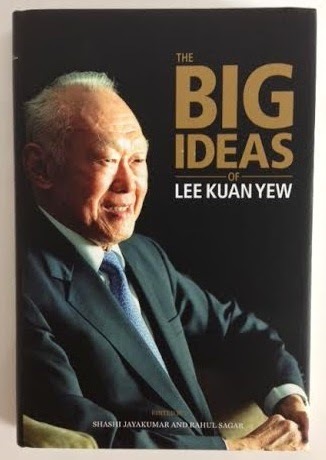 Conspicuously located in the sea of books at every corner is non-other than LKY’s “Big Ideas”. Ostensibly, you need to grab the book and subconsciously pay for it, which I did. Sounds familiar….. no choice…. Haha! Anyway it costs S$29.96 including GST. I then asked my 3-year old daughter who is this uncle. She answered “Ah Gong”. We broke into laughter and I told her, IF only she is your Ah Gong….. Anyway it’s another traveling week ahead, so I thought why not just bring a companion with me to kill some time onboard the plane and also while waiting at the custom in the airport. The Big Ideas is a 196-page book comprising of essays from the people who had worked closely with our former Prime Minister. Lawrence Wong, Minister of Culture, Community and Youth said in a conference two days ago on the Three “Big Ideas” for Singapore. See more on the news here. What are you Big Ideas for Singapore?